• For sensitive and high-throughput phosphate determination. 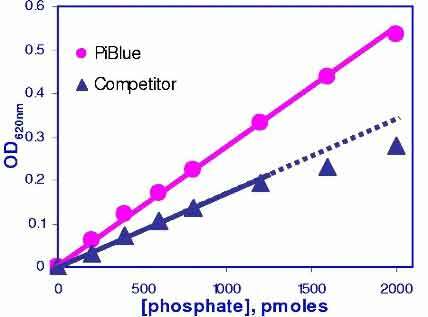 • The PiBlue™ Phosphate Assay Kit is based on a proprietary formulation of the malachite green dye. The PiBlue™ reagent forms a blue colored complex with free orthophosphate. The rapid color formation from the reaction can be conveniently measured on a spectrophotometer (600 - 660 nm) or on a plate reader. The non-radioactive colorimetric assay kits have been optimized to offer superior sensitivity and prolonged shelf life. The assay is simple and fast, involving a single addition step for phosphate determination. Assays can be performed in tubes, cuvettes or multi-well plates. The assays can be conveniently executed in 96-well plates for high-throughput screening of enzyme inhibitors. 1. What is the difference between your 3 phosphate assays: DIPI-500, POMG-25H, POPB-500?